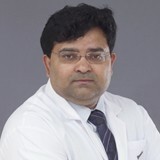 Dr. Sunil Punnose Thomas completed his MBBS in 1995 from Christian Medical College, Ludhiana, Punjab and MD Radiology from the same institution in 2001. He then continued as a faculty member doing various advanced imaging techniques in MRI and CT scan. He specialises in all aspects of diagnostic imaging with over 15 years’ experience in imaging and diagnostics. He holds the professional membership of Indian Radiology & Imaging Association (IRIA) as well as Radiological Society of North America (RSNA). He has completed many professional courses to upgrade his knowledge as well as a short observership at the prestigious SCTIMST’s interventional radiology department. He has keen interest in research and academic services and has conducted numerous studies, with special emphasis on imaging acute abdominal pain. He is actively involved in auditing and improving patient satisfaction at NMC Healthcare, where he heads the Department of Radiology & Imaging. Dr. Sunil can speak English, Malayalam, Hindi and basic Arabic.